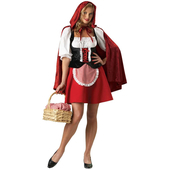 The Red Riding Hood Costume includes a short red gingham dress with attached white apron and lace-up corset effect to the front. Also included is a short red hooded cape. Stockings and petticoat pictured sold separately. liked it but the only negative thing i have to say about it on a night out when you start getting warm the red runs into the white and turns the sleeves pink. Loved this costume, good fit and its short without showing anything which is what I was after. Arrived really quick too so I was very happy. Really short but with the white petticoat it looks fab! I'd disagree with the previous comments, I thought it was great. Its well worth getting the stockings too, I had to place a second order cause decided I wanted the whole look. cape is kind of stiff too! VERY SHORT! Be warned! It's even shorter at the back for some reason. The inside lining is itchy and uncomfortable against my skin. The bust area was stretchy but hard to fill out for less well endowed women like me. Around the sleeve/shoulder part is elasticated and is maybe meant to go off the shoulders and the sleeves are quite puffy and big. As a whole i wasn't really a fan and wouldn't recommend it. Also don't be deceived: stockings are not included!